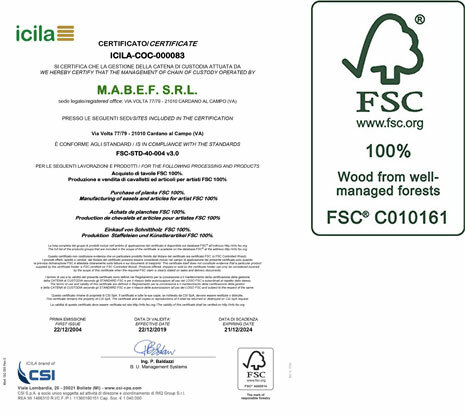 The material used is solid Beachwood coming from certified geographical areas and from woods where reforestation is under control of local regulations and guaranteed by forestry commission (we have got the FSC® certification on December 22nd, 2004 - ICILA-COC-000083). In this way, the wood used is constantly replaced. The Beachwood is extremely resistant and long-lasting and will accompany us throughout our life and over. Its beauty improves with the passing of time. It is 100% recyclable and ecological. All the wooden scraps, shavings and saw dust are collected, broken up and through a very elaborate process, transformed in “pellets”, an ecological fuel, for heating all the factories and offices, which, while burning, releases carbon dioxide in quantities equal to those previously absorbed by the living plant.